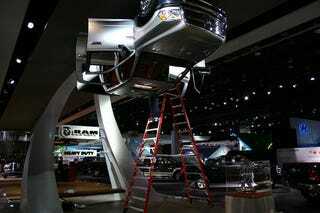 At last year's Detroit Auto Show a falling Pentastar nearly decapitated us. Now, with help from their Italian overlords, Chrysler's developed a more successful threat; another post like this and they're dropping a Ram on our tiny, fleshy heads. We really hope the laborer on the ladder's trying to make sure it's more secure. We really would hate to see what happened last year happen again this year.